Whether you believe in evolution or creationism, it is hard for technology to beat the natural world when it comes to design and function. Often it is best to study nature and try to emulate its wonders. That’s what Audience has been doing for its voice processor that can be found in NTT DoCoMo’s new mobile phone, Sharp SH705iII. Audience created the A1010 Voice Processor and based it on the intelligence of the human hearing system. The Audience A1010 supports Sharp’s Triple Kukkiri Talk by providing noise suppression, voice equalization, and voice stretch performance. It doesn’t matter if annoying noise comes from the caller’s environment, or over the network from the other end of the call, Voice Processor reduces multiple noise sources to make for a clearer call. The Audience Voice Processor is the first custom IC to be modeled on the human hearing system. By understanding the auditory pathway, from the cochlea to the brainstem to the thalamus and cortex, Audience is the first company to create a commercial product based on the science of Auditory Scene Analysis (ASA). 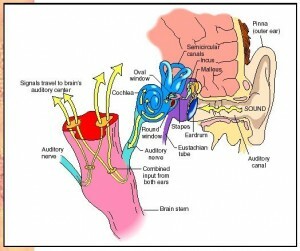 The Audience Voice Processor is able to deal with a complex mixture of sounds and handle the signals the way the human brain actually perceives specific sounds. This allows the technology to identify and suppress noise sources that would otherwise interfere with a call. There is similar technology out there, but it makes sense to start with how we hear and tailor the technology to that, instead of ignoring the human hearing system and focusing simply on the electronics.